Hockey IQ might have the catchiest name of the bunch, but EA's NHL 13 actually is pretty loaded with new features and additions. Together with a selection of the most fan-requested improvements for both on and offline game modes, all this newness should make the game more accessible and truer to the actual sport than it's ever been. True Performance Skating – A game-changing innovation for the franchise that adds physics-driven skating and over 1000 new animations, True Performance Skating authentically replicates the explosiveness, momentum and top end speed displayed by today’s NHL players. True Performance Skating combined with the Skill Stick finally gives gamers access to the entire toolset of an NHL player, delivering unprecedented control and unlocking a level of creativity never before possible in a hockey videogame. GM Connected – The largest multi-user online dynasty ever in a sports videogame with up to 30 user managed teams and 750 players. GM Connected takes the franchise’s most popular offline mode, Be a GM, and allows you to play with and against your friends in your own NHL starting with the 2012-2013 season and continuing for up to 25 seasons. With five ways to play, the mode offers unrivaled accessibility and depth allowing players to play, coach, or manage. GMs can also take their experience with them through the NHL 13Mobile Companion app*. EA SPORTS Hockey I.Q. – An innovative new A.I. system where players and goalies are now fully aware of every other player on the ice, resulting in quicker, smarter and more true-to-life decision-making. EA SPORTS Hockey IQ also delivers the deepest and most customizable set of real-world hockey systems and strategies ever for the franchise. NHL Moments Live – Rewrite or relive history as you replay some of the most thrilling moments from today’s NHL. Moments from the 2011-12 NHL season will ship on disc and updated content featuring 2012-2013 moments added as and when available. New Look and Feel in Hockey Ultimate Team – Create the greatest fantasy team in sports with Hockey Ultimate Team. In a mode without career lengths or a salary cap, acquire and assemble top players from around the world, then take on opponents within a massive online community. HUT in NHL 13 features an enhanced storefront, all-new collections, and a new auction house – where for the first time ever, you can stay connected through the NHL 13 Mobile Companion app*. Presentation Overhaul – A presentation overhaul designed to match the gameplay innovations undertaken in NHL 13 ensuring that the game looks as good as it feels. Additions include Team-First Presentation, the all-new True Broadcast camera, linear HDR lighting, dynamic skate spray, enhanced player models, and a stunning recreation of the 2012 NHL Winter Classic, and much more. NHL 13 Mobile Companion App* – Stay connected to your EA SPORTS NHL experience with the NHL 13 Mobile Companion App*. At home or on the go, interact with friends and rivals in GM Connected and Hockey Ultimate Team modes as you stay on top of schedules, trades, the HUT auction house and league news. 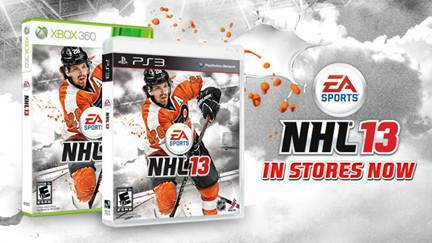 NHL 2013 is in stores now for the Xbox 360 and the PS3 for $59.99 USD. There's also a special edition of the game (which includes a neat Stanley Cup embossed tin) for $79.99 USD and it is, of course, a part of the company's 'Season Ticket' promotion. Season Ticket wraps up all the DLC for the year in a tidy bow for most of EA Sports' offerings, you can check that out here.